The chokecherry is a shade intolerant shrub that is in the Rose (Rosaceae) family. Some consider this a tree. Also known as the Eastern Chokecherry or the Red Chokecherry, it often forms shrubby thickets. In Ojibwe this shrub is known as Asasaweminagaawanzh. It grows prolifically from sprouting stumps and root suckers. It grows fast and has a short life span. 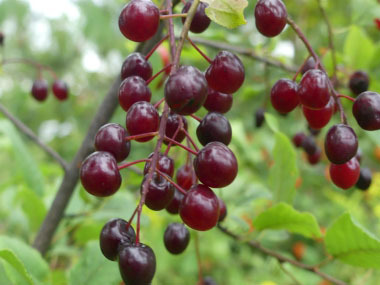 In fact, on average chokecherries grow 4 to 6 metres (13 to 20') in 40 to 60 years. Trunk/bark: The trunks are often twisted and is generally 15cm (6”) in diametre. The bark of the chokecherry is dark grey-brown, becoming darker with age and mature specimens are almost black. Chokecherry bark is smooth or finely scaly. Lenticels are present, but not in horizontal patterns which is characteristic of most other species in the Prunus genus. Branches/twigs: Twigs are slender, but stouter than the black cherry. They are light brown to grey and have a strong unpleasant odour when broken. Buds are 8mm (1/3”) long covered with brownish scales. Height: This shrub can reach to 8 metres (26 ft) tall. Leaves: The leaves grow alternate, simple, oblong to nearly oval, 5 to 10 cm (2 to 4”) long, finely serrated margin, with an almost hair-like tip. Leaves are dark green above and paler below, and there are minute glands on petiole. 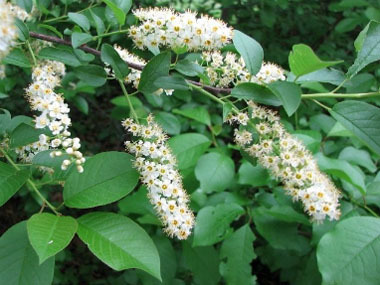 Flowers: Chokecherry flowers are white, found in loose, cylindrical clusters (long terminal raceme) that range from 8 to 15cm (3 to 6”) long. Chokecherries usually flower in May to early June. 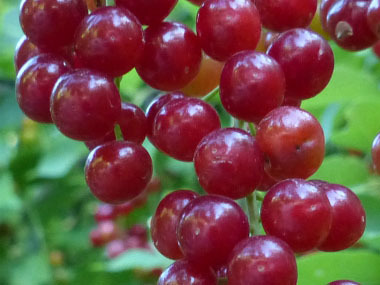 Fruit: Dark red to purple drupe, 8mm (1/3”) in diameter, maturing in late summer. Mature fruit hangs in clusters of 6 to 12. 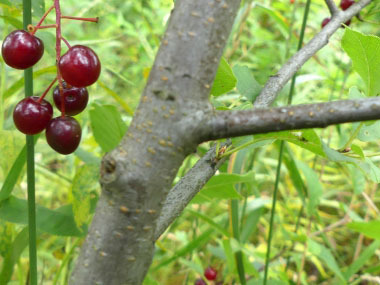 Habitat: Chokecherries are often found in open woodlands located on rocky terrain or other disturbed sites. It prefers part to full sun. They also grow well in rich soils. 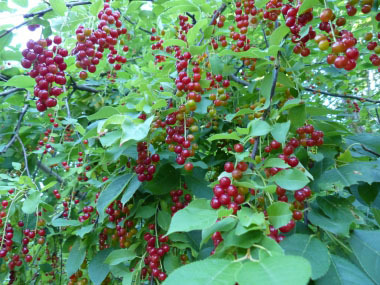 Chokecherry bushes can be found throughout Canada and the U.S. Edible parts: This unique fruit can be eaten fresh or cooked, but the pit should never be eaten unless the berries have been cooked or dried. The pit (not the fruit) contains hydrocyanic acid, which is poisonous. The acid in the pit is destroyed when the berries are cooked or dried. 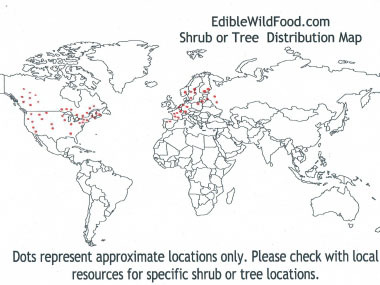 It is important to note that all parts of the tree with the exception of the cherry flesh contain hydrocyanic acid.